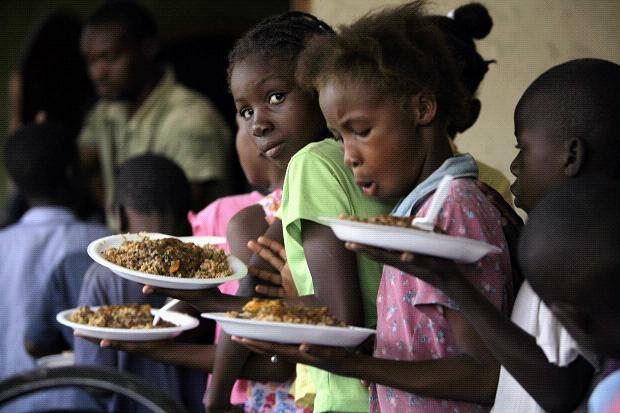 Children leave the Muncheez restaurant in Port-au-Prince. The restaurant owners have been giving out free meals to children in the camps for homeless earthquake survivors. Lunch was patés, which look a bit like Cornish pasties that someone has stamped on. But the children were very excited. Most of them had had nothing but bread or the United Nations high-energy biscuits to eat that day. The cook, 19-year-old Valencia Desiluz, was frying them in hot oil, for anyone with 5 Haitian gourdes (about 10p) to spend. When my turn came I had a nervous bite: the crunchy pastry was good, but it opened up a Worcester sauce reek of dried fish and onion . This was a little bit further than my stomach was prepared to go on a first date with Haitian disaster camp food. So I gave the rest of the paté to two small boys — Stanley and Dieudonné — who thanked me politely and ate it before we’d finished exchanging names. Read the rest of this article at Times Online.